It is not a Black Swan event that will cause the (inevitable)decay; it is merely a mathematical progression and conclusion of the deterministic Asset Debt Macroeconomic Asset Peak Valuation saturation. 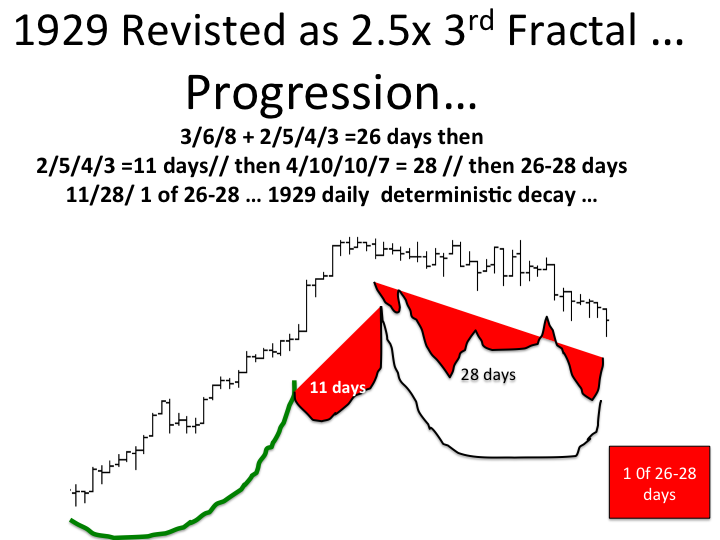 The current Hegemonic Nation’s 3rd Fractal Peak Equity Saturation Values are transpiring. 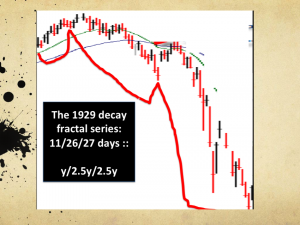 Like 1929’s US 2nd fractal’s final asset bubble, the 1932 US third fractal’s final asset bubble – in a similar 90 year sequence – is denominated in Equity Assets. Qualitattively historically low interest rates were necessary to prevent further collapse, sustain, and regrow the 2008- 2010 crashed real estate market. Bond and bank historically low returns offered an uncompetitive alternative to the rising bubbling equity markets. Japan’s Nikkei recent 3 month growth is a blow-off caricature. Monday 13 November 2017 is the 26th day of the second decay fractal with a very high probability for a nonlinear gap lower than the previous 25th day’s (Friday 10 Nvember 2017)low. 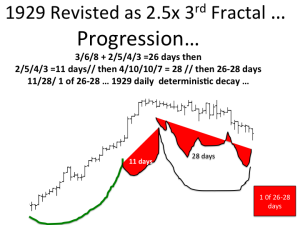 Will the Asset Debt Macroeconomic System’s x/2.5x/2.5x/1.5x ideal fractal pattern hold for a predicted 1789 US Hegemonic Series of: 37/90(ideal 36 years)/90/52-54 years? The 52-54 year fourth fractal 2021 to 2072-74 would represent a time of asset debt system debt liquidation, lower asset valuations, lower salaries, more unemployment, and contracting and slower growth. Cities and states who can not print their own money will have difficulty in maintaining both pension funding and city services. Sad prospects for the global system …. At the end of a great US 37/90/86 year :: x/2.5x/2.5x Macroeconomic System run, it may be time to consider a well reasoned and fashioned debt jubilee.